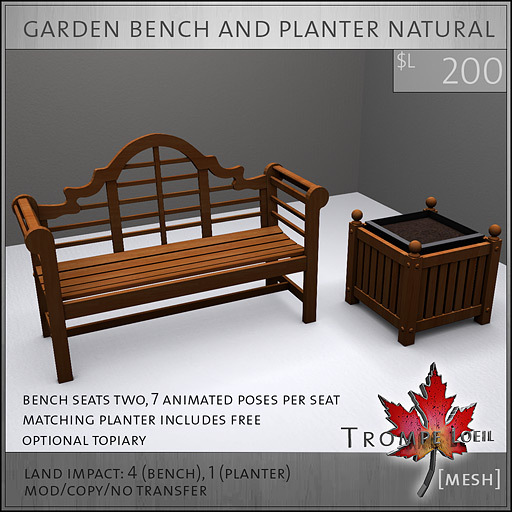 Its been a while since we’ve participated in the Spruce Up Your Space sale, but we’re thrilled to be back this month with a lovely little garden bench and planter set for your outdoor decorating! 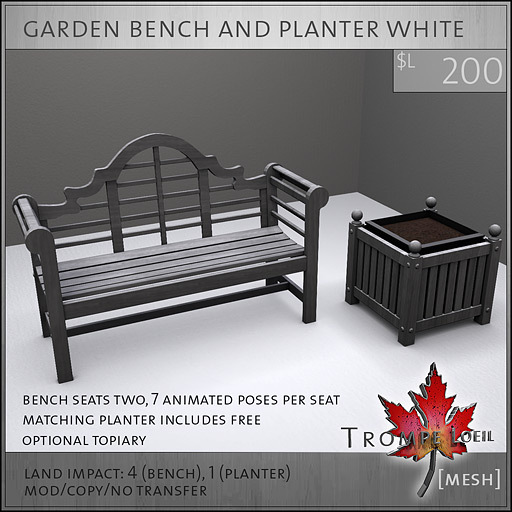 These matching bench and planter sets are the perfect low-prim mesh addition to your garden, porch or patio. Available in four wood colors, the bench will seat two with 7 animated poses available per seat, and both the bench and planter include removable shadow prims. The planter also includes an optional copy of our popular lighted mesh topiary! For Spruce Up Your Space weekend (June 30-July 1) these sets are on sale for only $L100 each! Swing in and pick yours up at the sale price while they last!